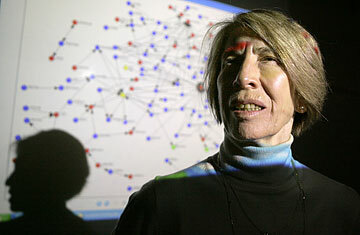 A computer model was projected over University of Pittsburgh professor Louise Comfort as she talked about the model and her research into tsunami detection Tuesday at her research lab on the campus in western Pennsylvania. PITTSBURGH » University of Pittsburgh-led researchers are hoping to develop a network of ocean-floor and mobile sensors that would help detect tsunamis in the Indian and Pacific oceans. The low-cost devices would complement existing deep-water tsunami-detection buoys, providing measurements and analysis of seismic movements more quickly and accurately than the buoys alone, said Louise Comfort, a professor working on the project. They would also offer greater coverage of the oceans by filling in large gaps between buoys, allowing scientists to promptly alert officials of undersea earthquakes that could trigger tsunamis and endanger coastal areas, she said. In Honolulu, Gerard Fryer, a geophysicist at the Pacific Tsunami Warning Center, said the idea is fine if the scientists have figured out a way of getting the sea floor pressure information quickly. "My initial reaction is it's unlikely to provide the wealth of information they think," Fryer said, explaining the major problem is communications. "The big difficulty is getting information back from the sensor if these things are in the water or on the bottom. ... We need data right now, and it's a very tough problem to solve." A magnitude-9 quake that ruptured the ocean floor off the Indonesian coast on Dec. 26, 2004, sent 33-foot-high waves into shores along the Indian Ocean, killing at least 216,000 people in 11 countries. The researchers devised the plan at workshops that were funded by a $200,000 grant from the National Science Foundation. The workshops were held last week in Berkeley, Calif., and on Maui in February. A total of about 50 seismologists, policy analysts, computer scientists and underwater acoustics experts attended the meetings. They plan to submit a grant proposal to the NSF for $3 million to fund tests off the coasts of the United States and Indonesia. "We need a combination of these ocean-floor sensors and deep-water buoys," said Comfort, who teaches international affairs and has conducted studies of emergency responses to most major earthquakes over the past two decades. "The deep-water buoys are very effective on the vertical determination," she said. "What they're less effective and almost not effective on is picking up any seismic movement that is horizontal, and consequently the deep-water buoys miss tsunamis." She said German buoys installed off the coast of Indonesia last summer failed to detect a July 17 tsunami that killed 600 people because there were too few of the buoys and they were placed too far from the earthquake site. Two international agencies issued warnings that the powerful earthquake could spawn destructive waves, but Indonesian officials did not convey them to local communities in time. "They didn't have a communications network onshore," said Comfort, who added that the sensor network would be integrated with such a communications system under her team's proposal. The sensors would carry computer chips and be placed on the sea bottom or sent gliding through the water to collect three measurements: seismic motion, water depth and wave speed. Star-Bulletin reporter Helen Altonn contributed to this report.